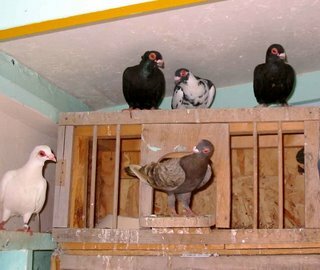 Palomas, palombe, palumbus….. a Romanian pigeon site. Because Romanian IS a Romance language. Someone told me this was “Portuguese”. I went to it and more or less understood a lot, having French and some Latin, Spanish, Italian. But it looked… weird. Then I saw the “ro” in the url…. The “Carunculat”– the pigeon in the home page– looks just like my Spanish Barbs. How old are the Mediterranean- Latin connections? David Satter wonders if another Chernobyl is possible in Russia, given their technology and a persistent culture of secrecy and unaccountability. Of course, in a fascinating book, Mary Mycio argues that Chernobyl’s effects were more complex and less simplistically devastating than the pop press or Greenpeace might have it (the area is now a vast wildlife sanctuary for rare species among other things!) But I still can’t help thinking it is a bit like the old George Leonard Herter chestnut: “Being eaten alive by hyenas is less painful than you would think”. How many pups will our Girls have? Steve and Val Kaeppler, fellow NM breeders, found a database based on 2080 saluki litters. Lash had six lurcher pups so I think this looks pretty rational. Also means a few slots are still open! It occurrs to me that this is a very doggy day’s posting. In the winter when we want to be hunting all the time I post on & think about writing etc– now, when I am either writing or in the garden, I dream of fall. Go figure! “… my beliefs collided with reality in a garden in Hungary. This gold dog will never be able to do what she was born for; never, not even once. She will hope and hope until hope fades and her body grows too old to do what she once so desperately wanted. “Meanwhile, the yaks lay contentedly on the ground, inert and happily so. These dogs who so resemble blankets are happy in their garden. They have no desire to use even the full extent of it; happy to lay nearest to the gate back to their kennel. They have no hunter’s body, and they have no hunter’s heart and mind. They have no desire, no mental desire and no physical desire, to move those heavy round limbs ending with heavy round feet, in anything resembling a sighthound’s way. They are suitable, the best fit for their situation. They are perfect here, in this tame place, with their domesticity, with their show-ring-selected bodies and minds. They are the products of static selection, based on static appearance and on somebody’s ideas of what must be the right thing for this breed to look like. The plush silky coat is gone, replaced by yak hair; the muscles, cut with definition and tendons hard as cables, are gone, a bland flat smoothness taking the place of sharp-cut convexity; the bladed tapering limbs, ending in feet so fine you can see the veins feeding them and the tendons working them and the details of the joints, these are all gone, exchanged for hairy round balls. Hair on the head and extremeties fine like a mouse’s; this, from an early breed description, is gone. And the behavior is gone as well. The hunter’s attentiveness, living all in their eyes and ears, alert scanners of the horizon; gone. “They have evolved. Under static selection, where hunting is an aberration, where trips to the dog show are the only outing they will have, they are the output of evolution toward a domestic dog who resembles a borzoi. They are facsimiles. They are happy here, eating their commercial foods, sleeping their undisturbed sleep, living through entire lives in this garden. They do not suffer frustration and disappointment. They will never grow bored and restless, they will never crave to be on the other side of this fence, to go, to run as hard as their muscles and bones and lungs can manage, to hunt, to feel the fast warm fur in predatory teeth. Their hearts do not long to stretch out lightlimbs over large empty spaces. The borzoi as I have tried to understand it, as I have striven to breed it, is completely missplaced here. And here is all there is; this is what the world will be, ever more crowded, ever more restricted, ever more domesticated. It is the gold girl who suffers here. Tom McIntyre found this NYT essay by Verlyn Klinkenborg comparing the blogosphere to the paleo- alternative media described by Catholic populist and controversialist Hilaire Belloc in the early Twentieth century. Update: have found it is now behind the Times’ subscription firewall. Still worth looking for if you subscribe. Prairie Mary gives us one of the best essays I have seen on the unglamorous side of the writer’s life, that is, life as we know it, here. “My income puts me four dollars over the poverty line, but this is a choice — as school teachers these days say in a blaming voice as though that explained everything. I knew I would never get even the first book written unless I escaped Portland and deadhead salary work. I saw poverty as a kind of freedom, a purity, a simplification. So I retired a little too soon. And yet, finally, this is not at all a depressing essay. A wonderful not- quite- new gun blog: Dave Petzal’s “Gun Nut”. Dave is possibly the most literate gun editor I ever (many years ago) worked with, funny, irreverent, and he knows everything– argue with him at your peril. * President-bashing is an American tradition that goes back to the beginning of our republic. Abraham Lincoln took a worse lacing from the press than any chief executive in our history. “Why, after reading The New York Times, would I bash Bush? Does reading it make you victim to some kind of thought-control process? Since I also bash Hillary every chance I get, is this also caused by The Times ? “Why would I prefer Al Gore, or that curious object, John Kerry? Does pointing out W’s many and horrific shortcomings automatically make me a supporter of those two goons? “I’ve been an NRA member since 1964 and a Benefactor Member since 1979, and I’ve been reading The American Rifleman since the 1950s. If we didn’t have the NRA, I would be writing about things other than guns because we wouldn’t have guns, but does all this mean I have to agree with every single thing the NRA says and does? Meanwhile, close to home, Albuquerque residents soon can choose between having all their dogs neutered and microchipped or owning them under even MORE restrictive rules. I am not remotely exaggerating. The original “simple, fair” regs promoted by Albuquerque mayor Marty Chavez were ” that all dogs and cats be spayed or neutered, provides the service for free or people who cannot afford it, requires dogs and cats to be micro- chipped, and provides an exception for bona fide breeders ” [ whatever they may be– State decides of course– SB] (City councilman Don Harris, Albuquerque Journal 29 April.) 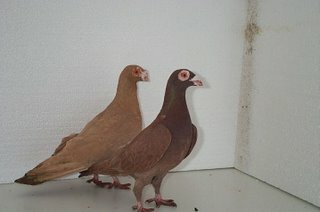 This is bad enough for any minor breeder with its $150 fee for intact animals, and NOBODY microchips my dogs and birds! “On Monday, the City Council will vote on a very different animal ordinance, Sally Mayer’s Humane And Ethical Rules and Treatment (HEART) Ordinance. The ordinance contains the spay, neuter and microchip provisions. However, they are a small component of a proposal that is as breathtakingly radical as it is totalitarian…. “The ordinance would create unlimited liability for the city. It states that “the City has the responsibility to ptotect animals in the City.” The courts do not impose that duty on the city with respect to people (unless they are in the city’s custody). If passed, whenever pigeons are killed, animal rights activists may have a cuase of action against the city…. “The proposal equates animals and people in many respects – referring to animals “incarcerated” at the animal shelter, referring to “foster care” for animals and providing a “safe haven” for animals dropped off at animal shelters…. “The ordinance equates animal abuse with domestic violence by requiring that all violoations of the lengthly law would constitute a petty misdemeanor requiring a court appearance…. I most certainly have a personal interest here. Three of my intact lurcher pups are in working homes in Albuquerque, and one of my forthcoming tazis is going there. 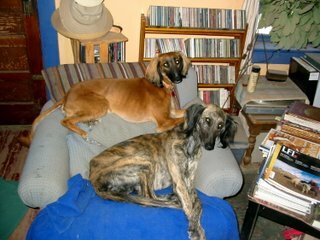 (The tazis have taken most of my income and energy for the last five years and are genetic gold, the only Asian saluki-type dogs in North America, the only ones of that stock whose ancestors have never stopped hunting, and a likely source of genes for working salukis as well as a distinct population of their own). I have given all these dogs away for expenses in order to place them well, and intend to breed them all. I certainly couldn’t afford such fees or, probably, survive a hostile inspection with my 120- year- old house and dusty yard. (I’m sure they would be especially fair to a falconer and hunter). But forget me. Where, O hunters and purebred dog fans, do you think your dogs will come from? Will there be any? If there are, will they cost $5000 apiece? Update: Wayne Pacelle personally challenges governor and presidential hopeful Bill Richardson on cockfighting. It’s a lose- lose situation for Richardson– a Hispanic hot button issue (pro- cockfihghting) and a national loser.